Digital media, unlike traditional, doesn’t demand that we pay all in advance and then wait for the results. It usually follows a pay-as-you-go model; whether you chose a pay-per-impression or clicks or conversion you only pay for what you use. Like traditional, it’s necessary to set aside a budget beforehand, but the money utilised is usually based on the model you create. It entails that you don’t pay the entire budget, but pay only in accordance to the clicks or engagements that you receive. In contrast, TV, magazine and OOH ads are notoriously expensive and unpredictable. With traditional, one can choose which medium works best for them and use slots based on that. Like what TV channel to pick or what slot on the radio to advertise in, etc. However, once the investment is made, there is little change that one can bring about in the plan since slots or channels can’t readily be interchanged in case the campaign doesn’t fare well. Digital marketing allows us to target the exact audience that we wish to get in front of and in a manner that resonates better with them. It could be with organic posts, video ads, etc. and in case the campaigns don’t fare well, we can update, alter or entirely scrap them if need be. Smaller brands sometimes don’t have the resources to deploy on advertising and data analysis as they focus on the product. Digital marketing platforms help by optimizing the ads based on the type of people engaging with them and show the ads to only those people. That being said it is important to review your ads on a regular basis because at the end of the day no one knows your customer the way you do. With more and more digital ad formats being introduced every day, the possibilities in storytelling seem endless. Each format has a purpose on the type of storytelling you want to do. For example, Facebook offers canvas ads that allow the user to click on the ad and it is redirected to a native Facebook page with your products, videos and text that allow you to weave a story around your products. Google introduced showcase ads under shopping ads that allow different products of the same category to be clubbed together and be shown to the customer. There are other visual based ads and text-based ads that you can test from and see which format allows you to represent your product in the most creative way. Never has there been a time where advertisers can get feedback on their products in a matter of clicks. Digital marketing gives room for direct interaction with the customers. Even though the ads are via the platforms, one can see how the customers are engaging, what they like or prefer over the other. This gives us a lot of scope to understand the customer’s perspective on our campaigns and how we can improve and build on them further. With every change, we get new insight which in turn helps us better the entire strategy. We want to share the below article with you from Entrepreneur writer Tina Garg. Tina talks us through the 5 big things that she sees as important for effective digital marketing in 2019. Can you believe we are almost into November!?? If you have the time and want to take on Google ads, we have a little recommendation for you. Google has launched their ‘Academy for Ads’ website. We have had a couple of hours to research this today and from what we see, it all looks pretty positive. This is a training platform that assists you with running your Google ad campaigns. Much like the digital garage, Academy for Ads is all about educating you on getting the best value for your advertising dollar by using Google’s best practice. Find training that gives you the tools to succeed, no matter your expertise -- whether you're new to online advertising or a seasoned pro. Once you sign in, you can access courses on all of Google ads and digital strategy best practices. Walk through learning paths then take an Assessment to prove your product knowledge. Earn Achievements and certifications to show that you know your stuff. If you are new to Google Ads, it is worth doing the bite sized courses. Alternatively, if you need help with this and find that your time is better spent on other areas of your business, feel free to get in touch with us for a free initial consult. 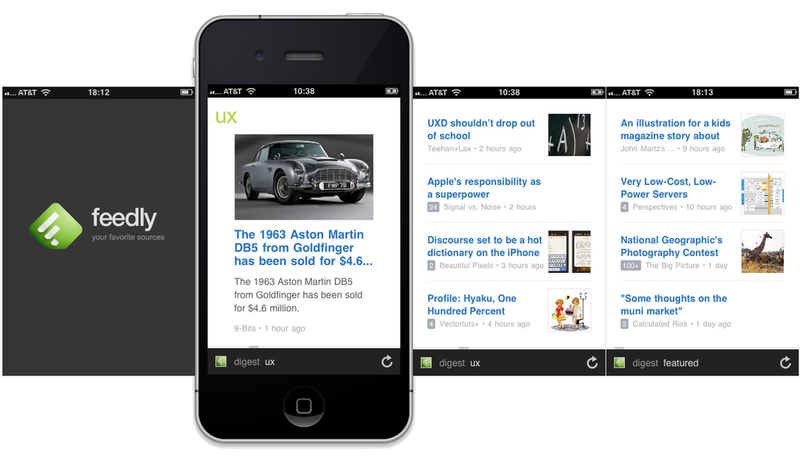 Feedly is a news aggregator application for various web browsers and mobile devices running iOS and Android and is also available as a cloud-based service. It compiles news feeds from a variety of online sources for the user to customize and share with others. Keep up to date with the best blogs and websites across topics that interest you. Tech, marketing, fitness, health, food, whatever your interest, you can develop your feedly to show exactly what you want to see. Monitor news about your company, your product, your craft, and your competitors. We are using this on a daily basis to also assist our clients with their PR and marketing activities. Hopefully it can help you too! In our opinion, the professional networking platform Linkedin is really under utilized here in the Northern Territory. It is actually the least used platform per capita in the NT. Having said that, awareness is growing and Linkedin Local has now been set up in the Northern Territory. Linkedin Local puts you in touch with the people behind the LinkedIn profiles! LinkedIn Local is a meetup concept that allows you to connect with your LinkedIn network offline, and create meaningful interactions. They are a passionate team from across the world, united around the belief that with authenticity, respect and collaboration, the door can be unlocked to a prosperous and sustainable living. Bronwyn Clee heads up Linkedin Local here in the Northern Territory. You can reach out to Bronwyn on her Linkedin profile by clicking here. We hope this helps with connecting you with like minded business people in the Northern Territory and they are not represented by or work for LinkedIn the company. We found this to be an interesting feature on the iphone. We quite often keep our clients informed of how their campaign is going via short videos that can be recorded and edited on an iphone. Below are the steps on how to activate screen recording. You may be able to use this to aid employees in your day to day. Press deeply the grey circle and tap Microphone. Open Control Center and tap the red record circle or tap the red status bar at the top of your screen and tap Stop. Go to the Photos app and select your screen recording. You can then use an app like Lumafusion to edit the content and then message or email the video. We have just started working with a local gym and after gaining the necessary knowledge of their business goals, we have really hit our straps with some positive Facebook advertising for this client. Take specific note of the cost per click number in the below stats! 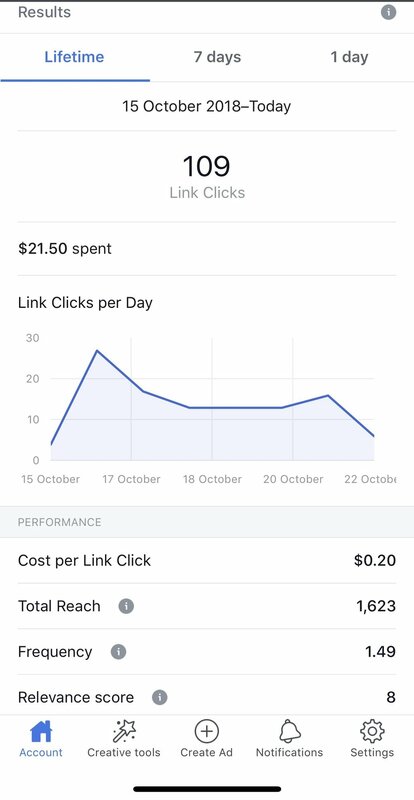 This campaign has been in operation for 7 days and has received 109 link clicks at a cost of $0.20 per click. We will run this for two weeks then assess conversions with the client. We have a goal of driving more gym memberships for 2018. This particular gym conducts a 12 week challenge. The October class is the largest yet with 36 members taking part. If you live in Darwin and want to make a change in your life, we can recommend HK Holistic Health Klub. Yes, they are a client of ours – but we only promote the best. These guys will get you the results you want! Marketing Land’s Amy Gesenhues has written this article that caught our eye regarding click bait.